In the 1880's, the New Mexico territory town of Appaloosa is being harassed by a corrupt rancher, Randall Bragg, and his henchmen. 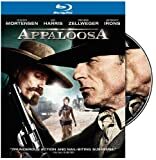 When Bragg's men kill the Marshall and his deputies, the town hires Virgil Cole and Everett Hitch as the new lawmen of Appaloosa. Their first task is to bring Bragg to justice. They manage to kill Bragg's men and arrest the rancher, but away from the jail Cole and Hitch's friendship is tested by the arrival of a beautiful stranger, Allison French. Bragg is sentenced to hang for his crimes, but he still has powerful allies. When he escapes, with Allison in tow, Cole and Hitch give chase to finish the job.